Over the past several years, the wave of refugees fleeing to Europe from the wars in Syria, Iraq, Afghanistan and elsewhere has fueled a growth in electoral support for parties offering voters a potent mix of populism, nationalism, xenophobia, and euroskepticism. In the run-up to Sunday’s election in Sweden, many observers anticipated that, in the wake of the large number of asylum seekers who have entered over the past half-dozen years, the Sweden Democrats would emulate the recent successes of the Front National in France, the Alternative for Germany, the Freedom Party in Austria, and the Lega in Italy and substantially increase their share of the vote from the 12.9 percent they received in 2014. After all, Sweden had accepted 30,000 asylum seekers in 2011; 44,000 in 2012; 54,000 in 2013; 81,000 in 2014; and 163,000 in 2015, a number that represented a larger proportion of the country’s population than the one million that entered Germany that year and prompted Angela Merkel’s famous “wir schaffen das” (“we can do it”—meaning manage the large number of refugees who entered Germany). The Sweden Democrats, which crossed the 4 percent threshold for representation in the Riksdag for the first time in the 2010 election when they won 5.7 percent of the vote, did in fact increase their vote share and number of seats on Sunday, obtaining 17.6 percent of the vote, an increase of 4.7 percentage points over their 2014 vote, and winning 62 seats in the parliament, an increase of 13. Drawing on the widespread resentment about the large number of asylum seekers, the difficulties in providing housing, health services, language training and social benefits for the immigrants, a number of well-publicized recent incidents of gang violence and car burnings in Malmo and other cities, and the media attention given its leader, Jimmie Ǻkesson, it’s perhaps not surprising the SDs attracted a vote that exceeded those for the Front National in last year’s French election (13.2 percent), the AfD in last year’s German election (12.6 percent), and the Lega in this year’s Italian election (17.4 percent). Still, while almost 5 percentage points larger than its vote in 2014, the SD vote ended up well short of the 20-25 percent predicted in polls earlier this year. While the Sweden Democrats were the big winners, there were three losers—the Social Democrats and the Greens, partners since 2014 in the minority government headed by Stefan Löfven, the Social Democrats’ leader, and the Moderates—the largest of the four-party non-left Alliance that includes the Center Party, the Liberals, and the Christian Democrats. The Moderates received 19.8 percent of the vote, 3.5 percentage points less than their vote in 2014. But that loss was offset by increases of 2.5 percentage points in the vote for the Center Party, which got 8.6 percent of the vote, and 1.8 percentage points in the vote for the Christian Democrats, which got 6.4 percent of the vote. As a result, the total vote for the Alliance remained roughly the same—40.3 percent, compared with 39.4 four years ago. The big losers in the election were the two parties that have governed since 2014. Sunday was, in many respects, a historic defeat for the Social Democrats. For the better part of six decades, from the 1930s through the 1980s, the Social Democrats never received less than 40 percent of the vote and occasionally received more than 50 percent, were hegemonic in political terms, and created the archetypal model of Scandinavian Social Democracy. On Sunday, the Social Democrats won 28.4 percent of the vote, a drop of 2.6 percentage points, and 101 seats, a loss of 12. That was their smallest share of the vote since 1908. Meanwhile, the Greens, which won 6.9 percent in 2014, dropped 2.6 percentage points to 4.3 percent on Sunday, barely surpassing the 4 percent threshold of representation, and won 15 seats, a loss of 10. Although we won’t know for sure until detailed survey data become available, some of the loss in support for the Social Democrats and Greens may have involved defections to the Left Party—until 1990, the Left Party-Communists—which increased its vote from 5.7 percent to 7.9 percent and won 28 seats, a gain of 7. While not in the government, the Left Party has supported the Social Democrat-Green minority government in the Riksdag. But some of the loss, especially that suffered by the Social Democrats, may have involved defections to the Sweden Democrats. If the Social Democrats did indeed suffer defections to the Sweden Democrats, there would be a certain irony given the asylum policy the government has pursued over the past three years. The Social Democrats were, of course, the dominant party in government in 2015, the peak year in the migration of refugees from Syria and elsewhere and the year in which Sweden took in a larger number of refugees, relative to its population, than any other member of the EU, including Germany. But they were also the dominant party in a government that, beginning in 2015, instituted a series of measures that greatly limited the number of refugees coming to Sweden in subsequent years. In November 2015, the government, like those in a number of other EU member states, introduced border controls. Under legislation that took effect in April 2016 for three years, refugees henceforth received only temporary residence permits, identity checks were instituted on all forms of transportation, the right to subsequently bring family members to Sweden was severely restricted, and the number of police officers stationed on the country’s southern coast was doubled. Whereas in 2015, 163,000 asylum seekers entered the country, in 2016 only 29,000 did. Last year, 26,000 entered and this year 23,000 are expected to enter. In May, the Social Democrats proposed new asylum restrictions that aim to reduce the number coming to Sweden by 50 percent, to 14,000 to 15,000 per year. Under the new policy, called “A Safe Migration Policy for a New Time,” which they said they would enact if reelected, they promised to make the temporary restrictions enacted in 2016 permanent until the EU agreed on new rules for asylum seekers and promised to further strengthen the identity controls, increase the number of places in secure asylum facilities, limit the ability of those given asylum to choose where they live, double the time those rejected for asylum have to wait before applying again, ban those rejected for asylum from ever returning if they refuse to leave the country voluntarily, and prohibit local governments from giving rejected asylum seekers any social benefits. The proposed policy led to some defections to the Left Party, especially among the Greens, who have been the strongest supporters of a policy of welcoming asylum seekers. But the policy wasn’t designed, of course, to please the Greens but, rather, to retain the support of Social Democratic voters who might otherwise be attracted by the xenophobic stance of the Sweden Democrats. Unfortunately for the Social Democrats, it didn’t stop the Sweden Democrats from increasing their share of the vote and didn’t prevent the Social Democrats from receiving their smallest share of the vote since 1908. In the immediate aftermath of the election, it seems quite likely that Sweden will continue to have a minority government but it’s not yet clear which parties will form the government. The Social Democrats and Greens, which together won 32.7 percent of the vote, will hold 116 of the 349 seats in the new Riksdag. 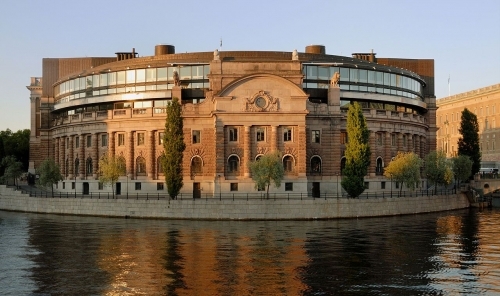 If the Left Party agrees to support a Social Democrat-Green minority government with its 28 members, such a government would have the support of 144 Riksdag members. The four-party Alliance, on the other hand, which won 40.3 percent of the vote, will hold 142 seats in the Riksdag. Both coalitions have rejected reliance on some or all of the 62 representatives of the Sweden Democrats. While the numbers suggest a parliamentary deadlock regarding formation of the next government, a likely solution lies along the lines of an agreement between the Social Democrats, Greens and the four parties of the Alliance in December 2014, a few months after that year’s election. After the Sweden Democrats had decided to support the opposition parties’ budget rather than the one put forward by the new Social Democrat-Green government, Prime Minister Löfven threatened to call a new election. That prompted the six parties to agree that until 2022 the candidate for prime minister who received the most support would be elected and that, in order to approve a minority government’s budget, the opposition parties would abstain in the parliamentary vote on the budget. A year later, under pressure from party members who were opposed to the pact, the Christian Democrats withdrew from the agreement and it was terminated. However, the other three parties in the Alliance agreed to allow the Löfven government to continue in office. Some variant of the 2014 agreement or 2015 modification will in all likelihood lead in due course to the formation of either a Social Democrat-Green or Alliance minority government. Whichever bloc forms the new government will then have to resume the unfinished business of providing the services needed by the recent immigrants and integrating them into the Swedish economy and society—and confronting the challenge posed by the Sweden Democrats.